Lab Culture Ep. 6: What is the Biosafety Peer Network? The Biosafety Peer Network (aka the Visiting Biosafety Official Program) links US local, state, and territorial public health laboratories with US-affiliated Pacific Island laboratories to facilitate mentoring and information sharing among biosafety officials and officers. The exchange is intended to foster a collaborative community, advance biosafety and biosecurity in laboratories, and ultimately improve public health laboratory biosafety and biosecurity across the US. So what exactly does the Biosafety Peer Network do? Three members of this network — Rebecca Sciulli (Hawaii), Paul Fox (Hawaii) and Anne Marie Santos (Guam) sat down for a conversation about their work. 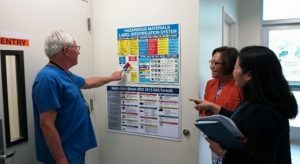 Photo: Paul Fox (left) and Rebecca Sciulli (center) giving Anne Marie Santos (right) a tour of the Hawaii Laboratories Division facility to showcase their biosafety practices, as part of the Peer Network program. If you’re enjoying Lab Culture, please rate and review on iTunes and/or Stitcher! The post Lab Culture Ep. 6: What is the Biosafety Peer Network? appeared first on APHL Lab Blog.